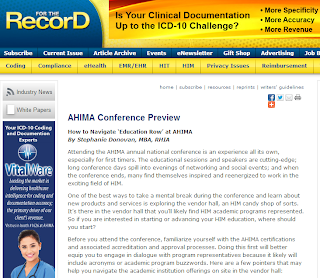 AHIMA’s annual national convention for health information management (HIM) students and professionals is right around the corner. This week-long experience includes informative sessions, professional speakers, networking events, and many opportunities where attendees can learn more about HIM innovations and educational programs. It’s also a great opportunity to meet faculty members from colleges and universities nationwide who lead academic programs in the HIM field. They’re wonderful resources to tap if you’re considering furthering your HIM education. There are also a few important questions you should ask to see if a program is a fit for you and your educational goals. I wrote about the questions you should ask in an article to "For The Record," a publication for industry professionals. Even if you’re not planning to attend this year’s AHIMA convention, you should include these questions in your thought process when researching HIM academic programs. Are you planning to attend the conference this year? If so, will you be using the conference’s resources to consider continuing your HIM education? If you have questions, feel free to ask in a comment below.